Welcome to Rob’s official website. A multi-award winning Broadcaster, Producer and Creator, he is best known as one of the main faces of News, Current Affairs, Political and Election Specials on Granada later ITV Granada Television in the UK. Rob co-hosted the first Weekend Breakfast programmes on BBC Radio Five Live with Jane Garvey and Julian Worricker. He was an Investigator on the BAFTA winning World in Action (ITV Current Affairs series); hosted his own commercial radio Talk and Entertainment Show, worked for ITN, broken major exclusives across Granada Reports/Granada News/News at Ten/ Channel 4 News and the press as well as picking up ‘Scoop Of The Year’ in the O2 Media Awards for an ITV Political Special before being appointed an OBE for ‘Services to Broadcasting’. 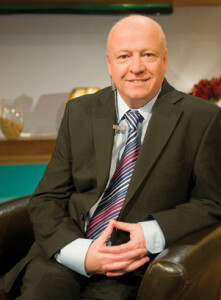 A former Board Director and later Advisor to Granada Television/Granada Media Group and ITV plc, he has created his own successful media businesses including Hasgrove plc which increased shareholder value by 457% on flotation and turned around and sold the acclaimed digital marketing business Amaze. He has campaigned for the North and UK’s media sector and united orchestras (RLPO/Halle) for the first ever time in an ITV/Classic FM spectacular with Opera, Pop and Show-Biz stars; oversaw a world-wide Number One for a youth charity project on ITV; made Arts, Entertainment and Sports programmes breaking new ground with his creation The Virtual Grand National which ran the race 24 hour early using CGI technology and picked the winner in 2018. He founded The Educate-North Awards which celebrates the success of the North’s world class universities and colleges as well as searching fro the next generation of entrepreneurs – it has been held annually since 2015 at a prestigious dinner in Manchester and supported by three popular radio stations Heart (Yorkshire) Smooth (North West) and Smooth (North East). Rob through Carm Strategy has advised private, charitable and other organisations across the UK, Europe and in America on communications, political change and management reorganisations.